Refined elevator oxford shoes with upper in ocean blue genuine cordovan leather that stands out for its natural shine and refinement. The sole in natural leather is made even more exclusive by the precious Goodyear stitching. 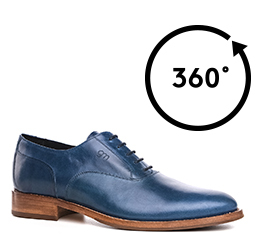 A classic dress shoe entirely made by hand and able to increase height from 2.4 (6 cm) up to 3.1 inches (8 cm).